Hollywood Beach Suites, is a secluded intimate and tranquil Caribbean paradise on the Island of North Caicos. Our four comfortable beachfront suites are directly on a stunning seven-mile stretch of sparkling white, powder-soft sand and look out on brilliant sweeping turquoise waters. This private vacation holiday oasis is located on Hollywood Beach in Whitby, on the Island of North Caicos, one of the renowned Turks and Caicos Islands. These Caribbean Leeward Islands lie in the British West Indies, a quick hour-and-a-half flight from Miami. Large walk-in shower with window overlooking coconut palms. Direct on a 7 mile power soft sandy beach, Beach towels and chaise lounge chairs. Free Pre-paid cell phones provided. Full size refrigerator and freezer. Small ice cooler also provided. Fits in bike basket. No cable TV. TV screen is for watching DVD or playing DVD music discs. No lawn, but extensive coconut palm trees and vegetation. Free use of ocean kayak for two. 2 dedicated bicycles are provided to each suite. Large wooden deck by the beach with chaise lounge chairs, and bistro table with chairs. Free use of: Snorkeling equipment (mask, fin, snorkel); Ocean kayak for two; Life vests. The property consists of 4 suites and we were the only guests for all but one night, which was an unexpected bonus. Alveda took excellent care of us - we couldn’t have had a better host! The suite was very comfortable and we enjoyed using the bikes, kayaks and snorkeling gear. If you want a complete escape from urban life, this is it. We needed an escape from “life” for a few days and that was exactly what we found! Quiet, well appointed, comfortable, private, the most beautiful beach we have ever experienced, the food at The Baracuda was yummy. We didn’t rent a car so we walked and road their bikes when we needed. A perfect getaway! They do need to provide drinking and cooking water since the water is not drinkable. We ordered a 6 gallon case be brought in and were glad we did. Alveda, our hostess, was outstanding in her thoughtfulness and care for us while we were there. What a great gem. We were greeted at the dock by Mrs. Gardiner and taken the short trip to Hollywood where she had our Snapper dinner waiting and warm for us. It was amazing! She arranged our car rental and she was absolutely excellent. We were the only couple at the suites for several of our 9 nights. This area of North Caicos was very non-touristy this time of year. We walked on the beaches, sometimes for hours, completely alone! It was mesmerizingly beautiful and quiet. Rent a car! 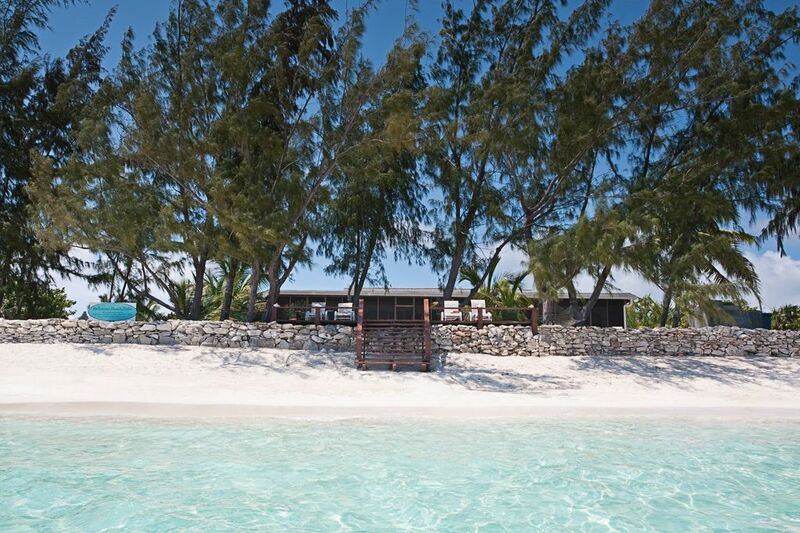 Three Mary Cays and Mudjin Harbour is down the road and is a must to see. At Hollywood, I used the kayak to go out about 3/4ths the way to the reef and saw all kinds of coral heads and fish. The water is stunningly turquois and clear. Breakfast on the deck with the sun coming up was amazing. Every evening we watched the sun set and listened to the waves. The screened patio was perfect. The kitchen, bath, and bedroom were all good. Not 5 stars but you cannot believe the stars you will see at night! We bought food at the IGA on Provo before we came over. It's a struggle to get it over on the ferry but can be done. Buy water and liquids once on the island. Grocery food is available but not that great. Most things close Sunday till afternoon if at all. I can't stress enough to bring CASH. We spent $1900 in 9 days and did not eat out that much but we rented kayaks and ate 3 times at "Last Chance Bar and Grill", must do! My Dee's, Silver Palm, Ms. B's, Baracuda, and Aqautic were all good too. Top two food- Last Chance and Mudjin Harbor Bar and Grill. Roads can be almost non-existent/ washed out. Use common sense. MUST go to Mudjin Harbor on Middle Caicos and hike the "Crossing Place" 1.5 to 2 hours hiking and not another soul but stunning ocean cliff views and secluded beaches. Conclusion? Perfect place to unwind and decompress. No TV aside from DVD movies. Cell phone reception is great everywhere, Wifi not so much/no. The suites are nice, not 5 star, but make up for it in location. This is not a place for pampering or partying as that doesn't really exist here. It is quite, beautiful, majestic and all those other words to describe paradise. Mrs. Alveda Gardiner is a gem and makes the stay that much better. We would go back and probably will. Wonderful secluded piece of paradise to unwind and recharge. My husband and I thoroughly enjoyed this little gem tucked away in North Caicos. We were looking for a place right on the water, and this is exactly what we found. Only steps away from a beautiful quiet beach with miles of white sand. The villa was stocked full of games, movies, books, and even bikes to peddle around the neighborhood. We loved Alveda the caretaker, she was so welcoming and even prepared a delicious conch dinner on our first night. Fresh water? She took care of it, rental car.. Alveda had them at our front door within an hour, reservations at the Silver Palm restaurant? No problem...table for two all set!! Even when our flight was delayed and we would miss the last ferry, again no problem!!! Jane and her husband took care of the hotel accommodations in Provo and also had a taxi waiting the following morning to the ferry. So...if you are looking for a great place to get in touch with nature and your partner... this is the place!! Don't forget to visit the dragon's tale in Mudjin Harbor on Middle Caicos! A must see!! Thank you for your careful and kind review. We are very happy you had a nice time and were able to enjoy the beach, ocean and suites and recharge. We look forward to welcoming you again. Peaceful, amazinging beautiful beach and water. Very comfortable, clean - nicely appointed. Great service all around. Enjoyed the kayaks, bikes and snorkeling. BBQed some fish and ribs. Had a yummy diner at Last Chance.